Congratulations to Gavin Schmidt. He's the newly appointed Director of NASA's Goddard Institute for Space Studies. Dr. Gavin A. Schmidt, new head of NASA GISS. NASA has named Gavin A. Schmidt to head the agency’s Goddard Institute for Space Studies (GISS) in New York, a leading Earth climate research laboratory. Currently deputy director of the institute, Schmidt steps into the position left vacant after the retirement of long-time director James E. Hansen and becomes only the third person to hold the post. "Gavin is a highly respected climate scientist who already also has proven himself as a terrific leader of the GISS team," said NASA’s Chief Scientist Ellen Stofan. "He is the perfect candidate to continue leading this vital research institute at a critical time for the U.S. and the world." 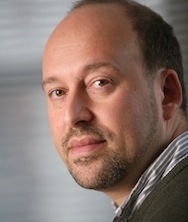 Schmidt, an expert in climate modeling, began his career at GISS in 1996. His primary area of research is the simulation of past, present and future climates. He has worked on developing and improving computer models that integrate ocean, atmosphere, and land processes to simulate Earth’s climate, and is particularly interested in how their results can be compared to paleoclimatic data. "It’s an honor to lead the team of talented scientists at GISS," he said. "The work being done here has implications for societies across the planet, and I will strive to make that research as valuable as possible." Schmidt received a bachelor’s degree in mathematics from Oxford University in 1988 and a doctorate in applied mathematics from University College London in 1994. He came to New York as a 1996 National Oceanic and Atmospheric Administration Postdoctoral Fellow in Climate and Global Change Research. In addition to more than 100 published, peer-reviewed articles, he is the co-author of "Climate Change: Picturing the Science" (W.W. Norton, 2009), a collaboration between climate scientists and photographers. In 2011, he was awarded the American Geophysical Union Climate Communications Prize. GISS was founded in 1961 as NASA's theoretical division for work on planetary atmospheres, under the direction of Robert Jastrow, and is today a leading Earth climate research laboratory. Major areas of GISS research include measurements, remote sensing and simulation of Earth's climate, the forces driving climate change and its impacts on human society, agriculture and ecosystems and continuing work on planetary climates in the solar system and beyond. GISS works closely with partners at NASA's Goddard Space Flight Center in Greenbelt, Maryland, and with the Earth Institute and School of Engineering at Columbia University. NASA's Earth science program monitors the planet's vital signs from land, air and space with a fleet of satellites and ambitious airborne and ground-based observation campaigns. NASA develops new ways to observe and study Earth's interconnected natural systems with long-term data records and computer analysis tools to better see how our planet is changing. The agency shares this unique knowledge with the global community and works with institutions in the United States and around the world that contribute to understanding and protecting our home planet. Haha congratz to Gavin. Deniers will be furious about this and that makes me happy :D.
Wow, you are really fast. You should get a job with an online newspaper. Gavin Schmidt is a great guy, seems to be very aware of the limitations and value of climate models. Congratulations. The first negative WUWT post about it is also already there. Better not read. 66 comments on WUWT now, virtually all of them insults. Bravo to Gavin Schmidt. I wondered who would replace Hansen but had this niggling fear that GS would be considered too young, despite his many achievements, and be passed over in favour of someone with more "seniority". Perhaps things are rather better now at NASA than they were under Dubya. Just how bad it was is mind-boggling, and anyone interested in the political war on climate science can read the full story in Mark Bowen's book Censoring Science. It will not make you happy. His willingness and ability to communicate the complex subject matter to all levels is extraordinary and he'll be in this job at such a critical time. Excellent news. Congratulations Dr Schmidt. This is happy news. I cannot imagine a better choice for this critical position. Thanks to that video I now have a reason not to hate the day after tomorrow... the movie not the day on the calendar. Congratulations to Dr. Schmidt. He's an extremely capable scientist, not to mention wonderfully level-headed and effective as a science communicator. An excellent choice. An excellent choice for this important position. If he makes the bobble-heads at WUWT hyper-ventilate, so much the better. Wonderful news. Congratulations to GS! Gavin's measured and insightful responses to comments at Real Climate are always most welcome here, as are the articles which he provides. A worthy successor to the great James Hansen indeed. You have just forced my hand into purchasing another book 'Censoring Science' which by having a number of books  on this theme I had initially passed by. SWMBO (She Who Must Be Obeyed) is getting edgy about the continued influx of books here, so I'll be in the Dog House again. Thing is public libraries no longer cater for those who like to examine the facts of technical and scientific matters. Amongst them Hansen, Schneider, Mann, Pooley, Oreskes & Conway, Washington & Cook, Hoggan, Lawrence, Boykoff, Romm. Bob Jastrow, the first director, is probably rolling over in his grave. In his later years he was a darling of the right -- back in the 80s he was arguing in favor of the development of Reagan's "Star Wars" initiative, for example, and he helped found the infamous George C. Marshall Institute. He had been a good scientist in his youth, but when I knew him as an older person I felt he'd badly lost his grip.